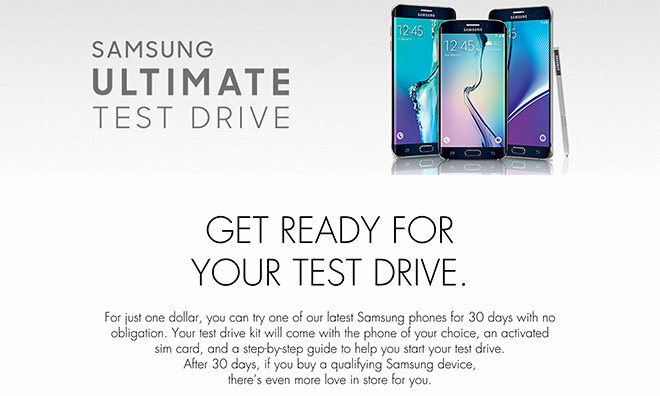 Called the "Ultimate Test Drive," Samsung's plan puts a Galaxy S6 Edge Plus or Galaxy Note 5 in the hands of an iPhone owner for one dollar, with no obligation to buy. As the strategy is to lure away Apple customers, the promotion can only be accessed by visiting a special webpage from an iPhone. Included as part of the 30-day test drive is an activated SIM card attached to a voice and data plan hosted by a user's current carrier, whether it be AT&T, Verizon, T-Mobile or Sprint. Samsung also sends along a cable to make streamline file transfers. Following the trial period those who "make the switch," or buy a qualifying Galaxy device, Samsung says, "There's even more love in store for you," though it's not exactly clear what the company means. According to Tom's Guide, all participants will have to send back their test drive kit —albeit for free —even if they are persuaded to buy one of Samsung's smartphones. Samsung is fighting hard to stay ahead in the global smartphone market amid harsh market headwinds, flagging sales and, most worrying for the company, incredibly consistent demand for Apple's larger screened iPhone 6 and 6 Plus models. The Galaxy maker attempted to get a head start on Apple this year by releasing flagship Galaxy Note 5 and Galaxy S6 Plus models last week, earlier than an expected iPhone launch in September.